Yes, I have tattoos. In general, I like tattoos. I often think that people don't put enough thought into their tats. If they have some sort of meaning to me, and I have wanted it for over a year, it's fair game! They are hydrangeas! And they are circled around the Japanese character "hana" which means "flower." 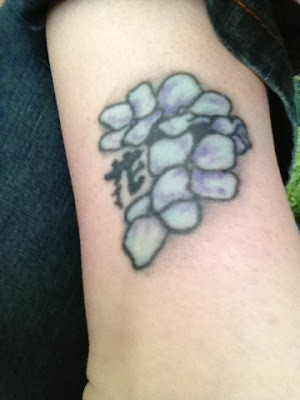 And yes, I am nerdy enough to know the Japanese character and word for "flower." That, I believe, is thanks to SMAP, a Japanese boy band that my friend, Amie, got me into in high school. And then Amie is first generation Japanese-American, so she can confirm these things for me. Now for the hydrangeas. Besides loving the flowers because they're beautiful, they are also natural pH indicators. I have a minor in Chemistry and it is one of the subjects that I love to tutor. What does this mean? The flowers change color based on the acidity or alkalinity of the soil in which it grows. If the flowers are more pink, the soil is more acidic. If the flowers are blue, the soil is more basic. Cool, right? When I was young, I got my first degree in Reiki. Reiki is literally spirit energy. It is the idea that you channel the energy you give off (and everyone does give off energy) in a positive, healing way. You use this to help others-people, animals, or plants. So my teacher, Lynn, taught me to visualize colored bubbles flowing out of my hands and into my patient to drive out the bad, dark things. I always used this visualization. And while I rarely practice Reiki anymore and did not get my last two degrees, it is still the most effective visualization for me. In addition, my mom always told me to visualize myself in a bubble if I ever felt scared or if I ever went into a hospital. It is meant to block negative energies. I still take a moment to put up that shield before I enter hospitals or if, for whatever reason, I feel scared at home. Fun random fact that makes no sense even to me: my shield bubbles are always pink. My parents divorced several years back and my sister and I were on the outs. After about a year, things started to feel better in the family front. My relationship with my mom has been almost entirely healed (my relationship with my dad wasn't harmed during the divorce, so that was fine). I continue to make small steps in right directions with my sister, which always makes me feel encouraged. 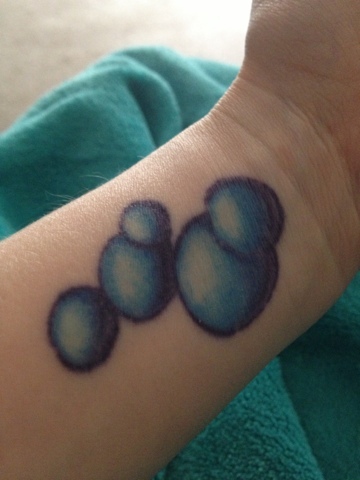 When things started to get better, I got the bubbles on my wrist. Bubbles for healing. Side note: I couldn't do all of the colored bubbles because my tattoo artist was afraid the lighter colors wouldn't show up very well. So those are the stories behind my current tattoos. Now you know. And my dad doesn't really approve, but he is tolerant. When I showed him my bubbles, his response was, "That's nice, Sweetheart." Hehe. I want more tattoos in the future. I know I want the symbol for the bear that Native Americans use, the quote, "shinjite-iru no shinjitai kara," which is romanji Japanese roughly meaning, "I will believe because I want to believe," and last but not least, I want the 13 hour clock from Labyrinth. Where I will get them all, I'm not sure. I might get one soon--I've been saving up. When I get them, I will give the stories. Look forward to it! These are beautiful tattoos, ma'am, and I love all the thought behind them! If I weren't Jewish and didn't have fibro and a fear of needles, I'd probably get one myself. But the hydrangeas make me want those as a henna, so..